Please allow 24 hours for your request to be processed. Learn about using our Online Instrument Tracking system here! With Aldinger Company's Online Instrument Tracking, managing your instrument calibration* and certification data is easy and convenient. You can view and print your calibration data and certificates instantly from the comfort of your home, office, or any other location where you have a computer with internet access. Aldinger's Online Instrument Tracking gives our customers instant access to certificates, and access to historical calibration data. View and print, or even download, your certificates 24/7 from our website. Through the same interface you can easily track your equipment's calibration dates and never miss a calibration again. Using laptop computers and Bluetooth printers, our technicians collect calibration data and label each instrument with an identifying calibration sticker at the time of calibration. Upon completing a calibration event the data is instantly transferred to our main database, making it available for you on our website. Because the data is transferred electronically, instead of being entered manually from written notes, the risk of human error is eliminated. 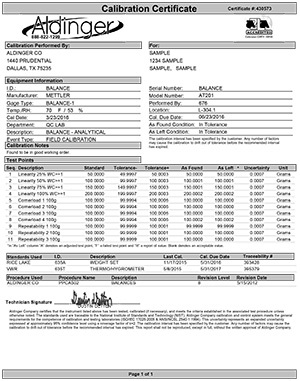 *Our calibration software is compliant to the following standards: FDA 21 CFR Part 11, ISO 9000, QS9000, ISO 17025, ANSI Z540 and TS16949. © 2008-2017 Aldinger Company. All Rights Reserved.